Are You Fueled By Donuts? Blog Marketing Email Marketing Are You Fueled By Donuts? Who doesn’t love a good reason to indulge in sugary deliciousness? National Donut Day is a real holiday created by The Salvation Army back in 1938 to honor the men and women who served donuts to soldiers during World War I. So we thought we’d jump on the bandwagon and celebrate by hosting a National Donut Day event at our San Francisco office! You don’t need an excuse to try Dynamo Donut’s famous Maple Glazed Bacon Apple donut or to be a little late for work, but who doesn’t need a little brain fuel? All you need to do is drop by our office on Friday, June 5th for a quick chat about how easy it is to send transactional email without becoming an email expert in our easily integrated, pay-as-you-go, SparkPost email delivery service. We’ll even throw in Starbucks coffee and a free Sparky T-shirt. Plus, you’ll be in and out in less than 30 minutes – promise! 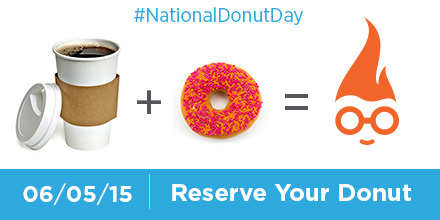 RSVP with your donut flavor preference and t-shirt size and we’ll take care of the rest.